Pat McDonnell Paints, located in Monksland Business Park, Athlone, is one of Ireland’s leading painting and decorating retailers. The business stands out from its competitors due to it having two fully qualified interior decorators on site to provide customers with expert opinion. Sinéad and Patricia trained in Dublin Institute of Design and Athlone Institute of Technology respectively. Both have worked locally throughout their careers and have a combined experience of 30 years in the industry. 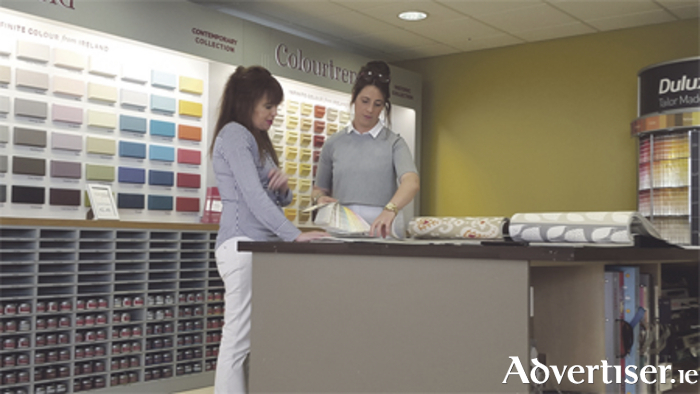 Sinéad and Patricia work with customers and advise them on new and existing colour schemes and designs for both their homes and commercial properties. The most attractive thing about the service they provide is their relaxed and friendly manner. Having worked with one another for years - including in a job before Pat McDonnell Paints - they are completely natural as a team and one cannot help but feel at ease in their company. “Customers can book an appointment for a free consultation where they will sit down and talk to the team and enjoy a nice cup of tea in a relaxed environment,” says Sinéad. Customers can bring pictures of furnishings so that Sinéad and Patricia know exactly what they are working with. Both interior decorators are extremely passionate about what they do and treat every job as though it was for their own home. They take inspiration from and keep up-to-date with changing trends by going to international trade fairs. Added to this, they choose colours and trends that are timeless, meaning you, the customer, get more value for your money. Once you have decided on the colour scheme that best suits you with the help of Sinead and Patricia, Pat McDonnell Paints will deliver your order to any location in Ireland completely free of charge. Pat McDonnell stocks a wide range of top quality paint brands including Farrow and Ball, Colourtrend, Dulux, Prestigious, Sanderson, and John Wilman, to name but some. The business also stocks a wide range of wallpapers, woodcare products, and decorating accessories. Most wallpapers can be sourced if not already in stock. The team at Pat McDonnell Paints take the hard work out of designing your home or business so that you can sit back and enjoy the experience. Pat McDonnell Paints is located in Monksland Business Park, Athlone. You can visit the colour consultancy room between 8am and 6pm from Monday to Friday, and from 8am to 5pm on Saturday. Alternatively, phone (090 ) 6444900 to set up an appointment. Take a look at Pat McDonnell Paints website at www.mcdonnellpaints.ie You can also follow the business on Facebook, Twitter, and Pinterest.